How Does Electro-Crystal Therapy Work? How Can Electro-Crystal Therapy Help You? What Happens During An Electro-Crystal Therapy Treatment? Electro-Crystal Therapy is an amazing therapy which combines the healing qualities of electro-magnetism with crystals to restore balance to your energy field. It was developed by the British scientist, Dr Harry Oldfield and involves the use of equipment that can be used to scan your energy field and then treat any imbalances present. It is a holistic, gentle and non-invasive treatment which is safe and suitable for all ages and can also be used on animals. 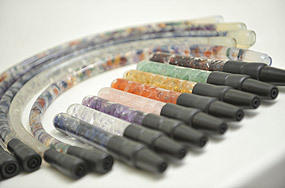 Electro-Crystal Therapy uses crystals contained in tubes called electrodes which are stimulated by pulsed electromagnetic waves generated by a battery operated machine. The treatment involves placing the crystal electrodes on areas of your body in need of energy rebalancing and applying the appropriate balancing energy frequencies via the Electro-Crystal Therapy machine. The equipment has been designed to provide a range of treatment frequencies which can be used to calm, balance or stimulate areas of your energy field as required. Different areas of your body respond to different frequencies. Also, different crystals are beneficial in certain zones of your body. Electro-Crystal Therapy has successfully helped many people with a whole range of physical, mental and emotional conditions. It can stimulate your immune system and enhance recovery from illness. It can boost your energy levels. It speeds up healing after injury and can act as a powerful pain reliever. It can provide you with a deep sense of relaxation. Please note that Electro-Crystal Therapy does not take the place of medical treatment and diagnosis. I will first scan your energy field using special diagnostic tools (Polycontrast Interference Photography or PIP and Electro-Scanning Method or ESM). The resulting scans indicate both the location and extent of the imbalances in your energy field. Your energy field is then rebalanced using the Electro-Crystal Therapy equipment. During the treatment you sit fully clothed in a comfortable chair and you simply relax. At subsequent sessions you will be scanned again to check on changes in your energy field and adjustments to treatment areas and frequencies are made where necessary. The treatment is completely painless and there are no known adverse side-effects. After the treatment, you may feel tired but this just indicates that your energy is rebalancing. £60 for a two hour treatment which includes an initial consultation, a PIP scan and an ESM scan. Before Electro-Crystal Therapy: PIP scan of client with long term pain in her right shoulder. After one Electro-Crystal Therapy treatment: The pain in the client’s right shoulder had reduced considerably. You can see that the energy in this area is much more balanced. Before Electro-Crystal Therapy: PIP scan of a client with a chest infection. After one Electro-Crystal Therapy treatment: The client’s chest infection cleared up. This is reflected in the healthier energy appearance in her chest area. For years, I have suffered from M.E. and in the past, I have tried many different kinds of treatment but none had much of an effect. However, after receiving Electro-Crystal Therapy from Jackie, my energy levels have increased, my headaches are much less frequent and I’m able to do much more than before. Electro-Crystal Therapy has definitely played a major part in my recovery.